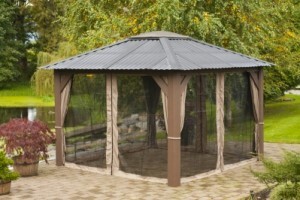 We carry a wide variety of Gazebos for use in any environment. They are particularly popular for adding privacy to hot tubs and spas. 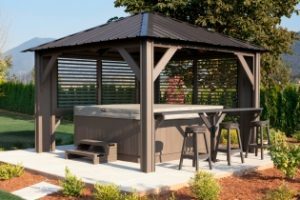 When you purchase your gazebo with your spa, you will qualify for a special VIP package price. 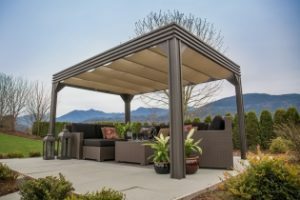 Visscher Gazebos are made in Canada. Wood sourced from Canada guarantees a finished structure as beautiful and strong as the land that grew it. Their mill and manufacturing plants are located in Chilliwack, British Columbia, not far from the forests where much of their wood is harvested. Each wood component is graded, cut, and painted in their own facilities, which gives them the ability to provide a consistent, high quality end product. Protect your guests from the elements and let the warm breeze through. The folding roof opens to let in as much sun or shade as you like. Add some privacy to your outdoor living space. The louvres in this example can be opened from inside or outside of the gazebo. Extend your home to the beautiful outdoors. 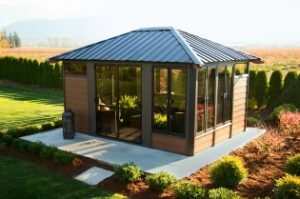 Add bay windows, screens, and extensions to customize your space. Built to Canadian snow load specifications. Steel roof, polymer skylight. Screens offer privacy or allow breezes, but keep out bugs.